Do you ever pour yourself a (big) glass of wine, then head over to your favorite chair, put your feet up, and then your puppy (or old puppy) comes over to sit right on your lap? Talk about a great night! If you can't relate, but know a person who absolutely loves their wine and kitty dogs, look no more for the purfect gift. You've just found it! 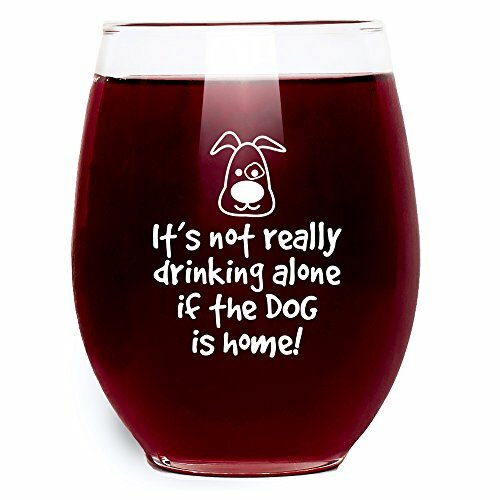 Oh, and always remember, it's not really drinking alone if the dog is home! A WONDERFUL GIFT IDEA - This wine glass makes a perfect gift for any occasion, holiday, or celebration. It's perfect for any full-time or part-time wine drinker that you know. It's not really drinking alone if the dog is home! Send happy vibes with this unique personable wine glass. Made in USA - Give the gift of laughter at home or at the office. Anyone with even the slightest sense of humor will love to sip their favorite beverage from this super cute wine glass and anyone without one will ask where to buy theirs!